When it comes to Mexican food most of us are all too familiar with tacos, fajitas and quesadillas. Not forgetting burritos, nachos and enchiladas. This familiarity means we miss out on so many other classic Mexican delights. Delights that are unlikely to appear in an ‘El Paso’ branded kit in the supermarket. 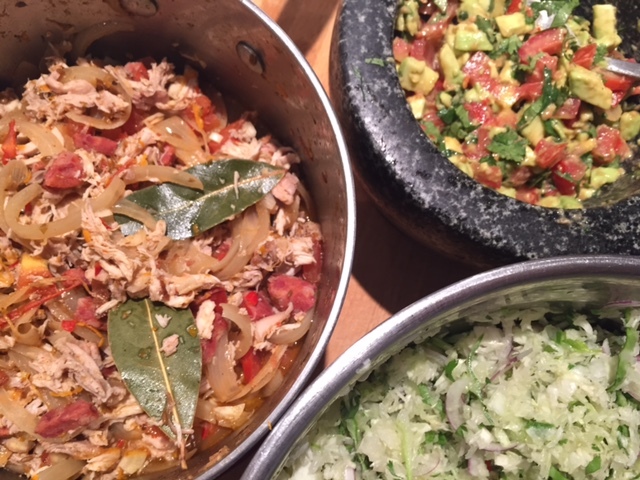 Yes there are unique Mexican dishes that are easy to make at home and super authentic. Like this spicy chicken and chorizo mole – the hero of my most recent Mexican feast. “Mole” is the broad name for a range of sauces used in Mexican cooking. The sauces themselves vary widely, but you’ll usually find of one or more types of chilli on the list of ingredients. Indeed it was the smoky chipotle chilli paste in this recipe that caught my eye. And, in adapting the original recipe. I dialled up the heat even further with a generous tablespoon of Cholula Hot Sauce. Not a big chilli fan? Think about how all of that extra fire boosts your metabolism (and burns off the very necessary accompanying breads). I was recently sent a bottle of Cholula Hot Sauce to try, and of course the first thing I did was check out the list of ingredients. I was pleasantly surprised. 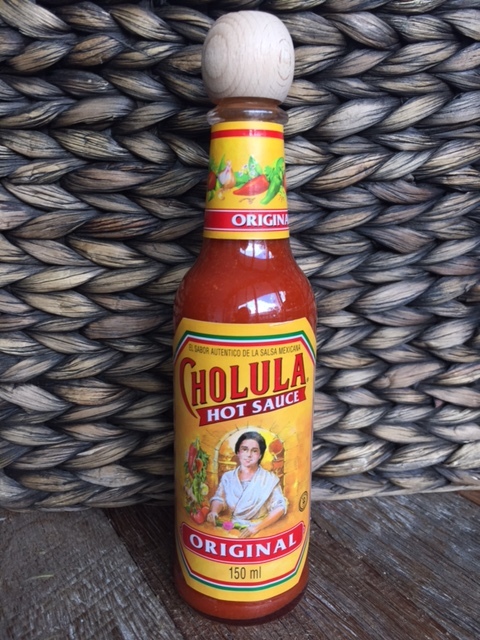 Unlike a lot of what fills our supermarket shelves today Cholula Hot Sauce is free of added sugar – perhaps because it’s still made from a recipe that’s over 100 years old. So I was happy to add it to my pantry it and thought this was the perfect recipe to experiment. Place the chicken thighs in a pan, covered with water. Add the bay leaves. Bring to the boil on a high heat, then reduce and simmer for 20 minutes. Remove from the heat, set aside and cover. Fry the chopped chorizo over a medium heat. Remove from the pan once golden. Add a splash of coconut or olive oil to the pan and cook the onions until soft. Add the garlic, cumin, oregano, cinnamon and chilli and cook for another minute. Shred the cooked chicken using two forks. 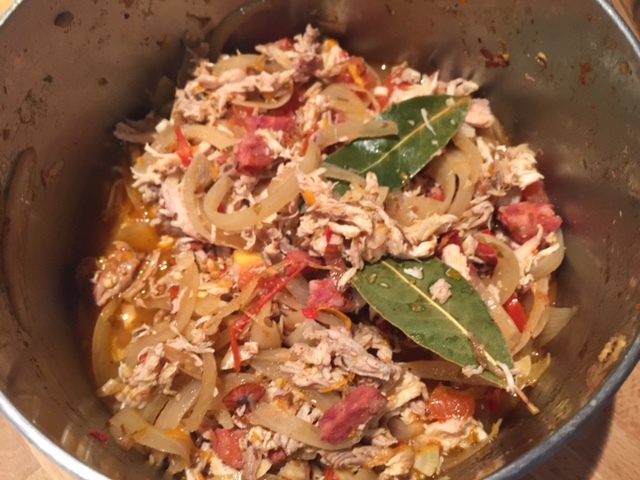 Return the chicken to the pan with the chorizo, stock, chipotle paste, tomatoes (optional) & orange zest. For an extra heat kick add a splash (or two) of Cholula Hot Sauce (or equivalent). Simmer for 15 minutes or until the mole (the sauce) is thick. Serve with crunchy cabbage salad, fresh coriander and lime and of course lots of home made guacamole. Cholula Hot Sauce – The number one selling hot sauce in America has made its way onto Australian supermarket shelves – keep an eye out for the distinctive wooden cap next time you’re in the Mexican aisle. Tags: authentic, chicken, chorizo, Mexican, Mole, recipe. Bookmark the permalink. Thanks Deb – yes I always try and throw a few facts into recipes where I can….